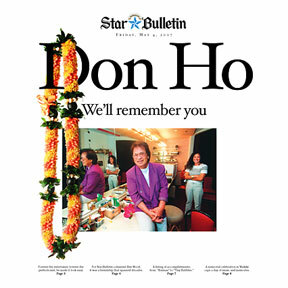 DON HO: Services for Don Ho are set for tomorrow. Today's special, keepsake edition honors the man, his music and his worldwide influence. TheBus will provide extra buses to help people get to Queen's Surf Beach in Waikiki for the Don Ho memorial celebration tomorrow. KCC will provide free parking and TV stations will provide live coverage.